Kids will keep fun of hours with this toy. They can explore and imagine like they are playing in the beach or have fun sand play or water play. Wader Sandpit is a colourful sand box with accesories for fun sand play or water play. This sand box made from 8 colourful plastic that can be fitted together to make a circle. 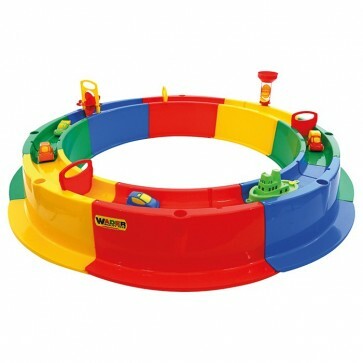 The outer ring of sandbox can be filled with water for water play with all accessories to be used within. Sand and water accessories includes boats, water gates, water mill and a wave wheel. Measures 18 H x 136 cm D.
Recommended for aged 3+ years.